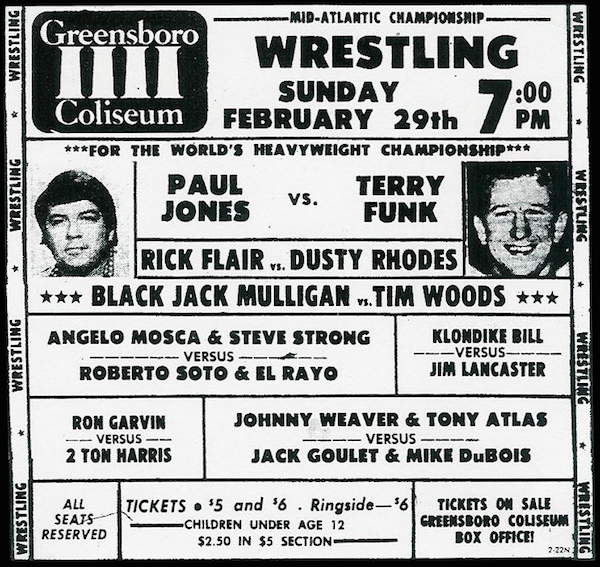 That's one of the first twitter posts I came across this morning when searching for photos of last night's "Big Time Wrestling" card at the historic Dorton Arena in Raleigh, NC. 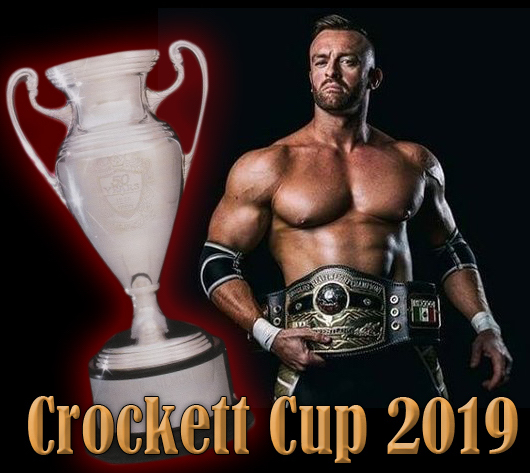 Fans of the independent wrestling scene in this part of the country know Jake Feuerbach better as "Man Scout" Jake Manning. Or if you are a devotee to George South's internet TV show "Dad You Don't Work, You Wrestle", you know him simply as "Bullitt." 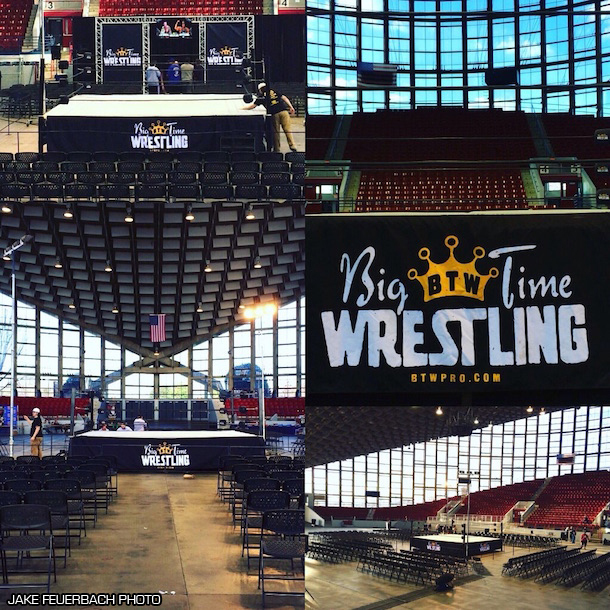 Regardless of what you call him, I found great humor in (and have great respect for) Jake's self-effacing acknowledgement of wrestling's return to this fabled old building sitting on the state fairgrounds in Raleigh. Jake isn't originally from this area. 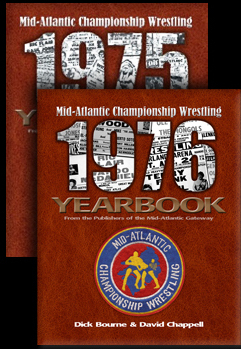 And even if he was, he isn't old enough to remember the great Mid-Atlantic Wrestling cards at Dorton. 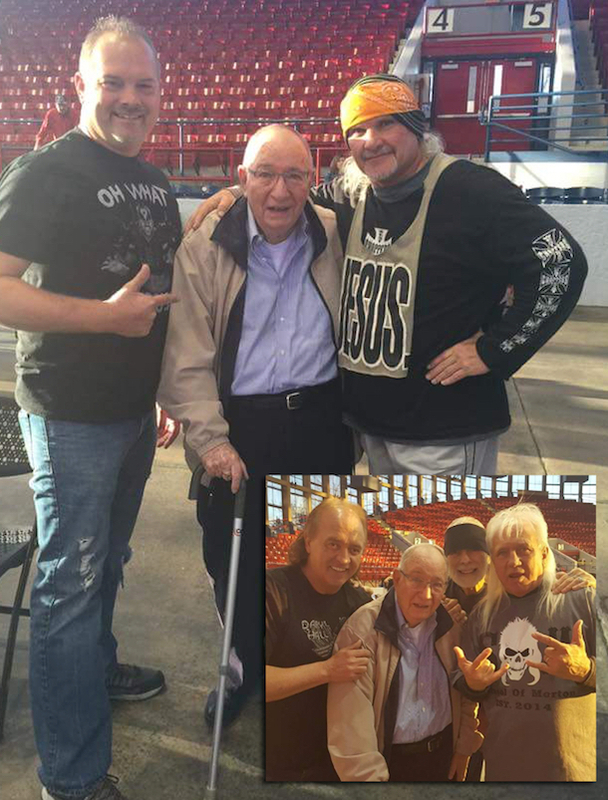 I'm assuming his general respect of the history of pro-wrestling here (and hanging out with George South for the last 12 years) has instilled in him the knowledge of just what a special place this was for pro wrestling. 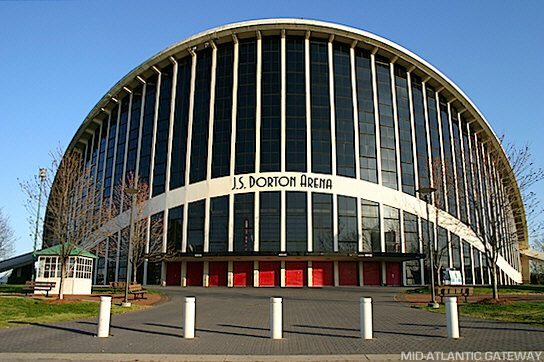 Dorton Arena is indeed hallowed ground. 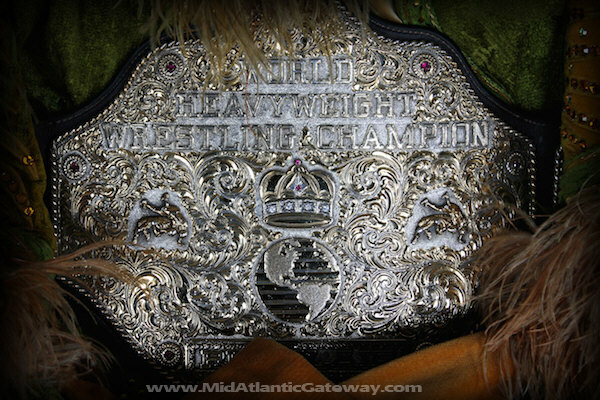 Big Time Wrestling proved they are indeed "big time" as they brought wrestling back here Friday night. 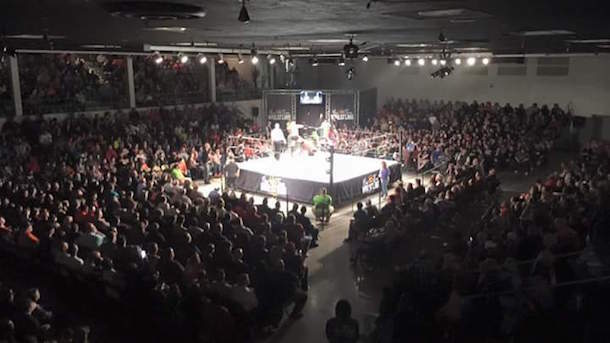 There was a huge crowd at Dorton, and they were there to see wrestling for the first time in 23 years if Jake has his facts right. Photos taken of the building set-up before the doors were opened Friday night. 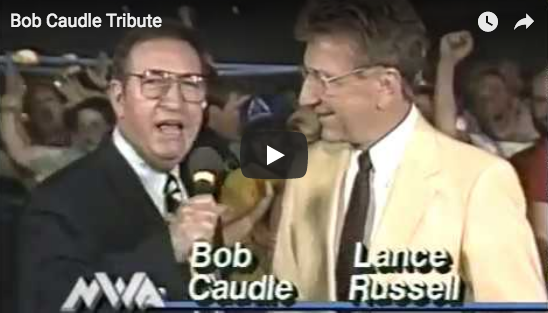 The most special thing for me was learning that wrestling broadcasting legend Bob Caudle was there to welcome the crowd to the show before it began. 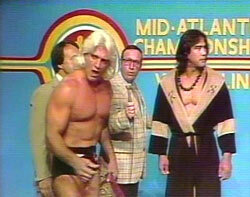 Bob hosted the "Mid-Atlantic Wrestling" television show taped at Raleigh's WRAL channel 5 studio for over three decades. 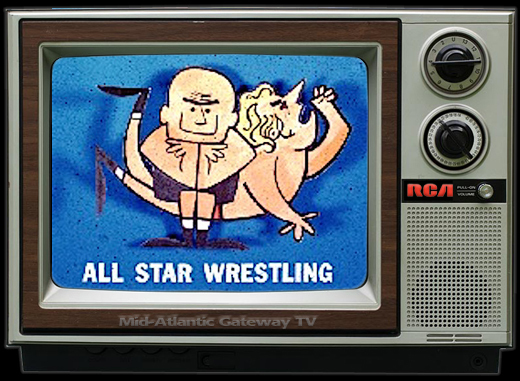 The TV show was taped on several occasions directly from Dorton Arena, too, and Bob's voice promoted many Tuesday night cards there. 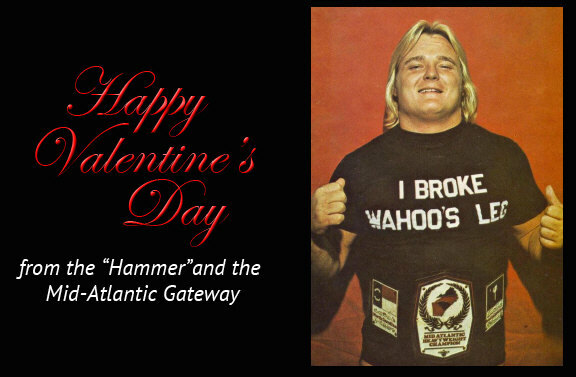 Bob still shares a special relationship with fans today, and is one of the most universally well-liked and respected people that worked in the business. He is also a great friend of this website. 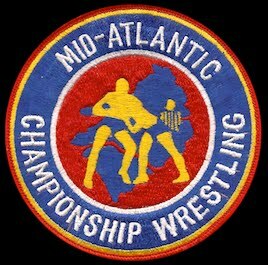 There were many other big names from Mid-Atlantic Wrestling's past at Dorton last night: the "Rock & Roll Express" Ricky Morton and Robert Gibson, "The Boogie Man" Jimmy Valiant, Road Warrior Animal, the "Powers of Pain" Warlord and Barbarian, Lex Luger, George South, and Jim Cornette, just to name a few. 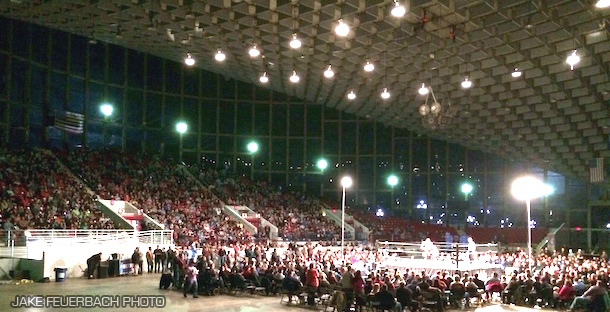 I wish other classic old venues in our area could experience another big crowd the way Dorton Arena did last night. Not many of the original buildings that were part of the Mid-Atlantic circuit in the 1970s and 1980s are left, but some are. 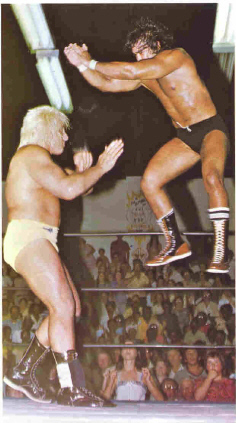 Wouldn't it be great to see a crowd this size in the old Independence Arena in Charlotte or the Township Auditorium in Columbia? 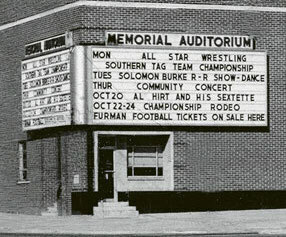 The Spartanburg Memorial Auditorium will see a similar card and similar crowd when Big Time Wrestling appears there tonight. 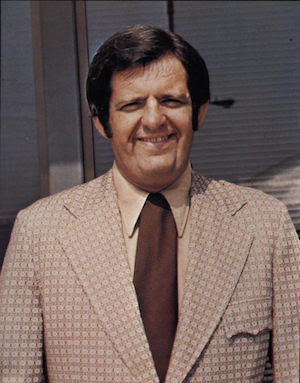 As "Man Scout" Jake Manning looked up at the lights of Dorton Arena, the sounds of that three count echoed off the saddle-style ceiling and enormous windowed walls of Dorton. 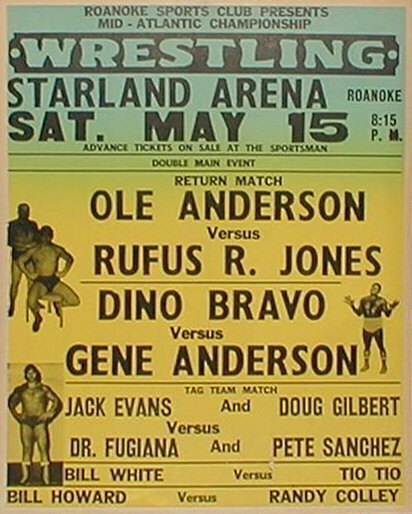 He now is part of a fabled history of a building which rekindled great memories of days gone by, and hopefully will enjoy again if Big Time Wrestling ever decides to return to the Raleigh fairgrounds. 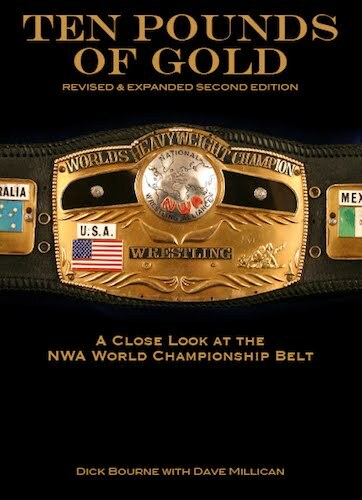 February 14, Valentine's Day, is the 30th anniversary of the debut of what many consider the greatest world championship belt in the history of the sport. it is without question the most beautiful. 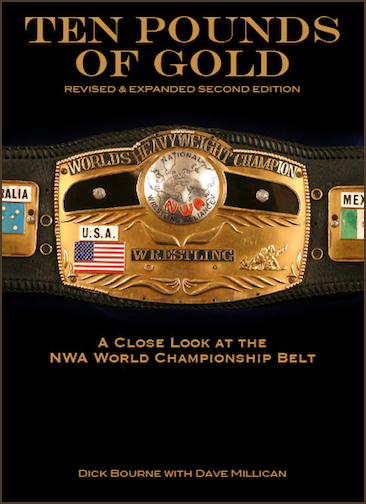 At the Battle of the Belts II event in Orlando, FL, on 2/14/1986, Ric Flair debuted the belt that would become known as "Big Gold" before his NWA world title defense against Barry Windham. 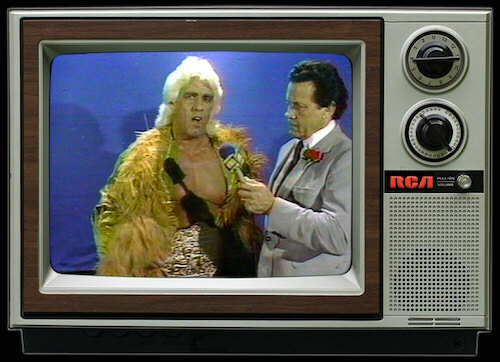 The first glimpse we got of the belt was when Flair interviewed with Buddy Colt in the dressing room only moments before his match with Windham. 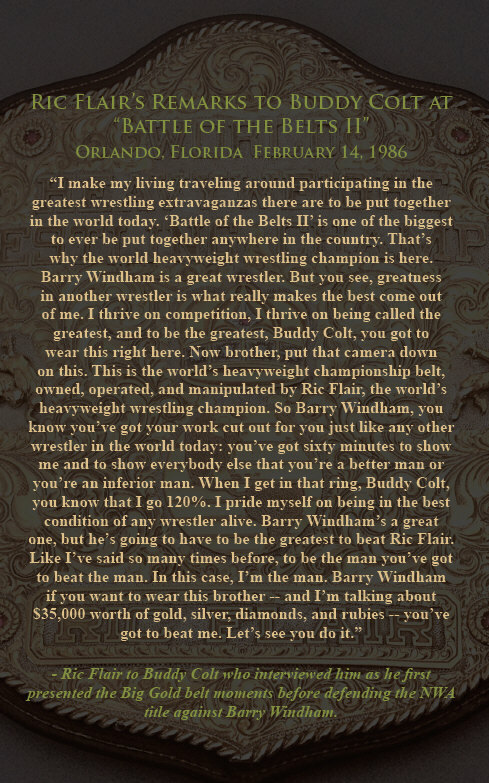 Below is the transcript of Flair's words to Colt as he showed the world the new belt for the first time. 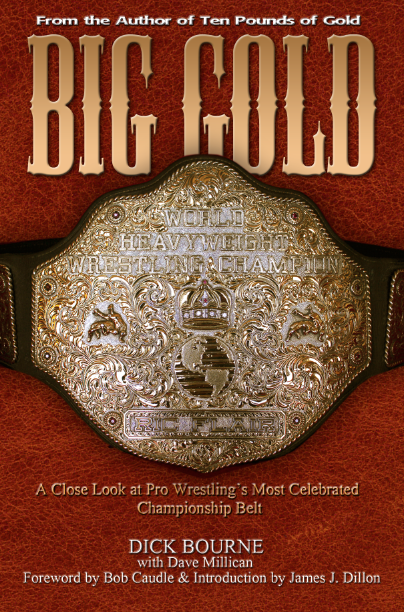 There is an entire chapter in the book "Big Gold" devoted to that special night in Orlando, including a special section of beautiful color photographs of the belt with the robe Ric Flair wore to the ring. 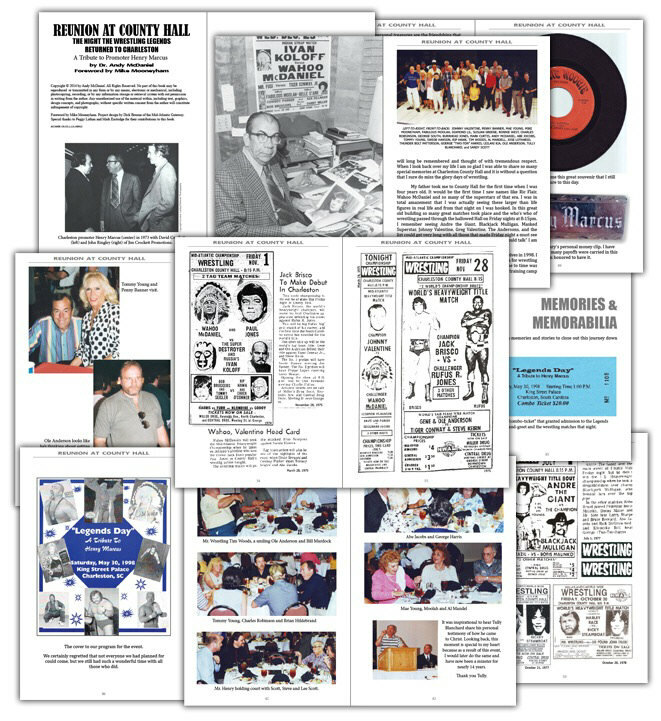 Lots of memorabilia, too, including the event program, event line-up sheet, newspaper and TV Guide ads, a special interview with Flair, and a detailed account of what went down that night. 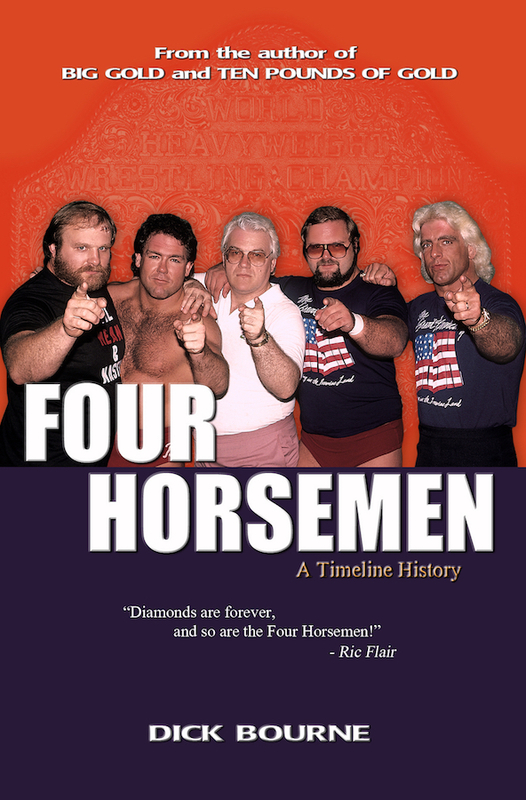 The FULL COLOR, 250 page book is available on Amazon.com. 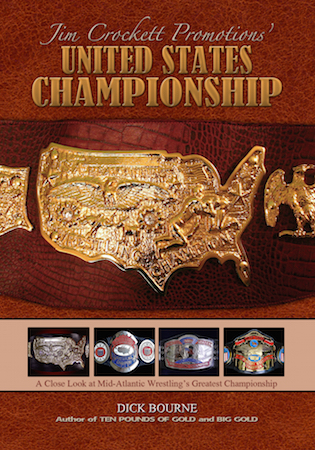 For more information, visit this page. 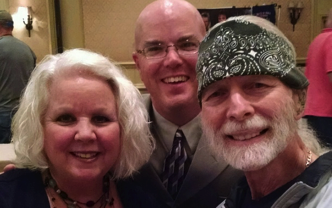 Think Ole Anderson was always a nasty, cold-hearted villain? Think again. 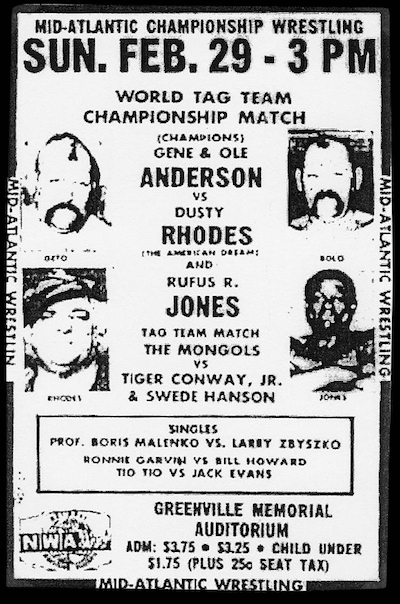 Those of you who know me know that during the 1970s, I was a regular on the front row at the wrestling cards in Spartanburg, SC every Saturday night. I went to the matches with my mother and grandmother and I can't remember ever missing one. No matter if I was sick, or if I had attended a Clemson football game that afternoon (and raced to Spartanburg after it was over with a Tiger Paw still painted on my face), or had just gotten back from the beach (I had to be back on Saturday! 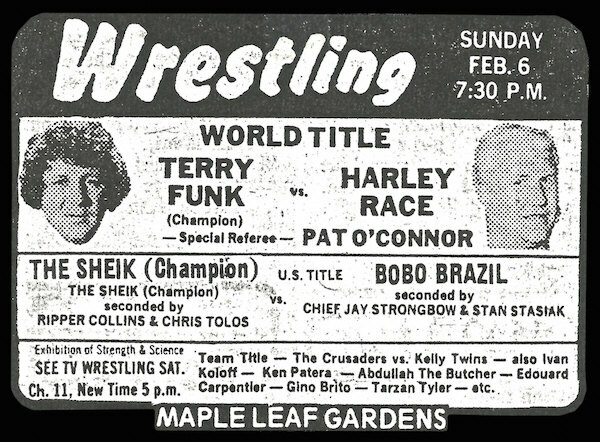 ), you could bet that I was always right there on the front row - - section B, row 1, seat 10. My mom had bought a new pocketbook that had a zippered pocket on the outside flap that folded over the main opening to the pocketbook. She would put her car keys in the zippered compartment so they would be easy to find. One night after the matches (about 11pm I guess) it was raining and when we got to the car, mom could not find her keys. The zippered pocket was empty, which meant we could not get in the locked car. We had to call my dad in Liberty, wake him up and get him to bring us another set of keys. 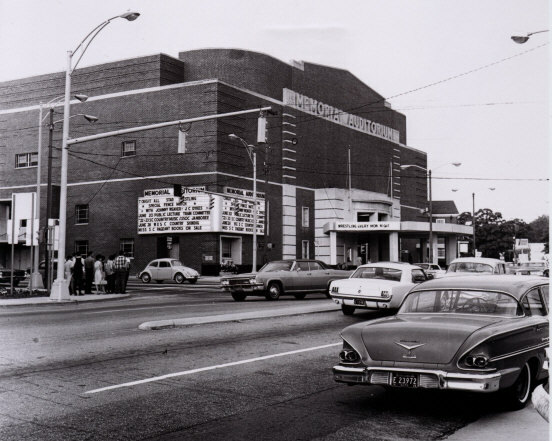 Those were the days without cell phones - we had to use the pay phone in the auditorium. Thank goodness for collect calls! It took about an hour to get from Liberty to Spartanburg. Anyway, here we were standing at our car in the pouring rain waiting on dad. 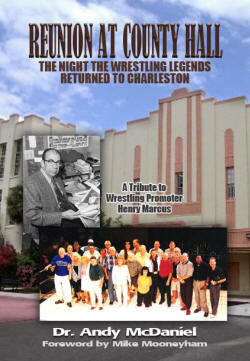 Most everyone that had been there that night, fans and wrestlers, had already left and went home. 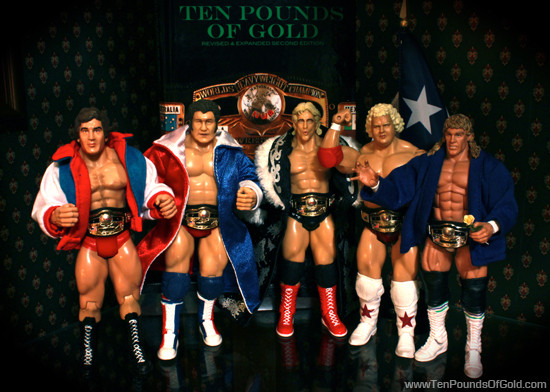 Everyone except Ole and Gene Anderson. Being the hated villains, they would wait until the parking lot cleared out before they would leave. 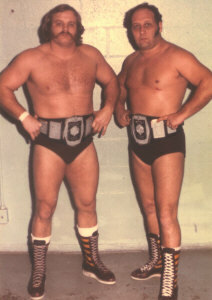 I had been friends with Ole and Gene for several years. 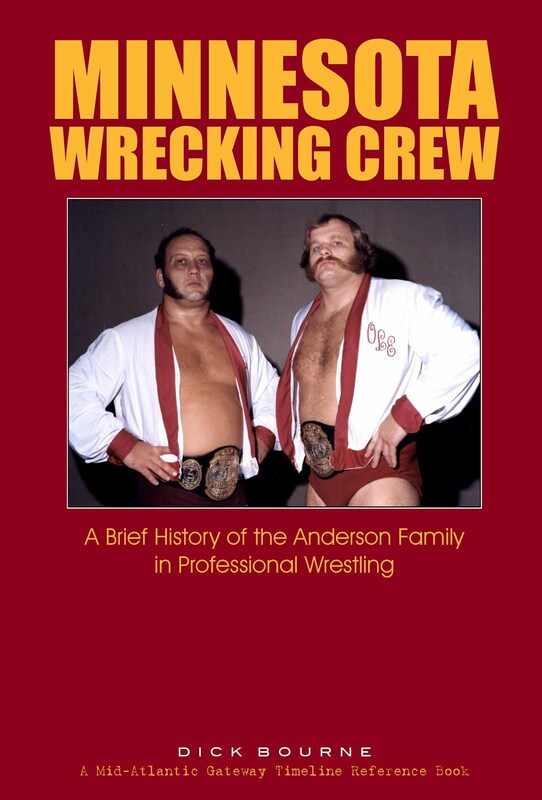 My grandmother Nannie loved giving the Anderson brothers a lot of grief at the matches for many of those years. They knew her well. 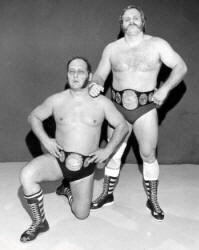 Ole and Gene came out and saw us standing there and asked me what was wrong. I told him that mom had lost her keys and we were waiting on dad to bring another set. "So you're going to stand out here in the rain for an hour" Ole asked? I told him we had no choice. "Wait a minute, " he said and told Gene to go on to the car. 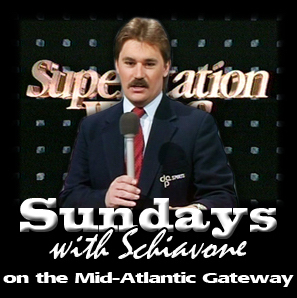 Ole went back inside the auditorium and reemerged a moment or two later with a wire clothes hanger. It took him a minute or two, but he finally got the door opened for us. He told us to get in and lock the doors. My Nannie, who had given Ole such grief from the front row at matches all over our area, suddenly had a momentary warm spot in her heart for him. "You hurry along, too," she said. "I don't want you to catch cold." That was my Nannie. 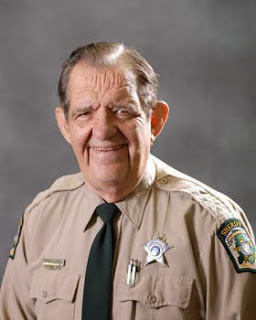 We thanked him for going to all that trouble to help us, and he jumped in his brown Ford convertible with Gene and they left. 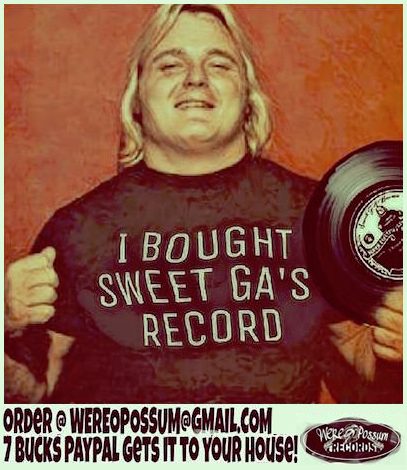 A few weeks after that at another Saturday night wrestling card in Spartanburg, mom lost her car keys again! We had to go to the pay phone and call my poor daddy again. Needless to say, he wasn't too thrilled about that. But my daddy is a good man and here he came again, another hour to the auditorium. So here we are again, standing at the car and Ole came out and saw us and said "Not again!" I said yep. He just shook his head and went back inside, got another clothes hanger and opened the door for us. Mom was so disgusted with the pocketbook, she began cleaning it out to throw it away. After emptying the main compartment, she shook it to be sure everything was out. She heard a jingling noise, but the main compartment was empty. But she could tell something was still in there! 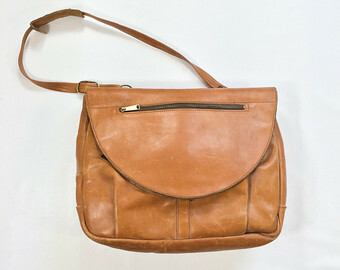 Come to find out, when she put the keys in the zippered outer pocket and lifted the flap to access the main part of the pocketbook, the keys would fall straight down into the bottom of a false-pocket. Because of a poor design, that outer zippered compartment was not sealed off at the top! There, behind the main pocket of the pocketbook, were two full sets of car keys. 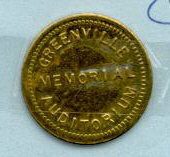 Many of you may know the story of how Ole was stabbed by fan at the matches in Greenville, SC in 1976. I was there that night and helped administer first aid to him as he lay bleeding in a hallway at the Greenville Memorial Auditorium waiting for an ambulance. He always tells me I saved his life that night. Ole's good deeds to me and my mother and grandmother those two nights in Spartanburg might seem less by comparison, but they were just as significant to me. Ole didn't have to stop and help us. It was late on those Saturday nights and he and Gene needed to get on to the next town. But he did help us, and it was events such as these over many years that have led to our lifelong friendship. 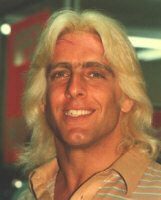 I will never forget him being my family's Good Samaritan. Twice!